Who : All new students in the Guthrie Public Schools District entering Pre-K and Kindergarten not currently enrolled for the 2018 – 2019 school year. Pre-K students must be 4 years old on/or before Sept. 1, 2019 Kindergarten students must be 5 years old on/or before Sept. 1, 2019 When : Monday, April 29 th from 12:00 to 6:45 Where : Your Neighborhood School . . . 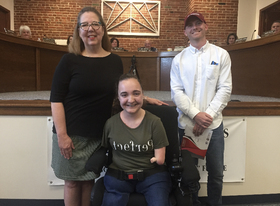 Nominated for Student of the Month by Angie Simonton was Shelby Frost, an 11th grader at Guthrie High School. Blake Wimsey from Foundation Insurance presented Shelby with a $60 gift card to Stacy's Place. Congratulations to Shelby for being selected as March Student of the Month. 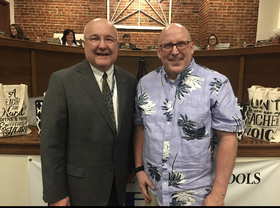 Congratulations to Mr. Jeff Jordan, who was selected as Guthrie Public Schools Teacher of the Year for 2019. Mr. Jordan, who is in his fifth year with the district, is an English teacher at Guthrie High School. Thanks to many sponsors, all building level teachers of the year receive gifts of appreciation. Mr. Jordan was also chosen as the Secondary Teacher of the Year. Amanda . . . If you have a PK-2nd Grader (Or if your child hasn't started school yet and you want to get a head start on their learning), please go to this link. These guides, which are designed to help in your child's learning, have just been released by the Oklahoma State Department of Education. They are easy to understand and a great tool for you to support your child's education. Oklahoma Family Guides PK-2nd Grade . . . The Oklahoma State Department of Education has released the Oklahoma State Testing Portal, which is designed to provide students and parents with online access to a student's state assessment scores. It is important to create an online account now, as paper reports will not be printed next year. In addition to providing online access to a child's state testing results, the portal will also assist parents and guardians . . . Both Cox Communications and AT&T are providing low cost internet to households with K-12 children who are eligible for the National School Lunch Program, SNAP, and/or TANF; who receive Tenant-Based Vouchers, Project-Based Vouchers or Section 8 Project-Based Rental Assistance. Please follow the links below to learn more. http://www.connect2compete.org/cox . . .